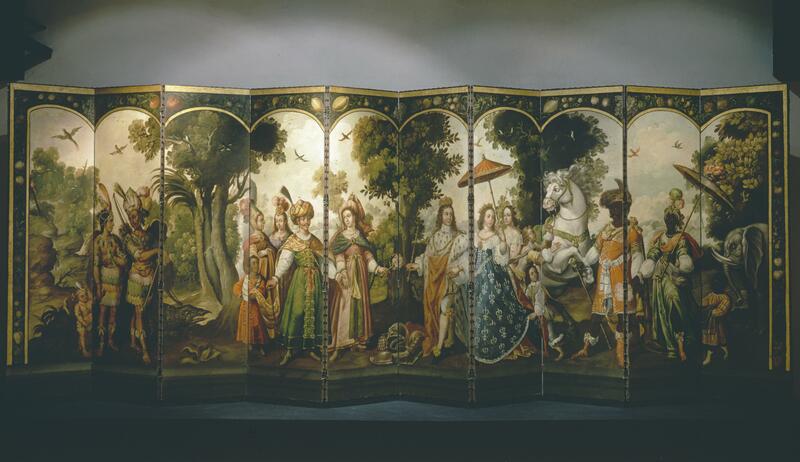 This folding screen, known as a biombo, represents an allegory of the Four Continents, with the Americas at the far left, Africa at the far right; with Asia and Europe near the screen’s center. 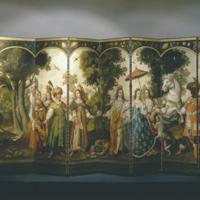 The scene stretches across ten panels, with the figures arranged as if all attending the same outdoor fête. The imagery has its origins in Europe, although the screen-format originally came to New Spain from Japan. This is thus a worldly object in many senses of the word. The couple at far left, dressed in feathers, represents the Americas. Their outfits are largely fanciful, not the clothing of any particular indigenous group. While the couple wears high status items, including elaborate feathered headdresses and jewelry, they, alone of all the personifications of the continents, have no servants, only their child. The scaly crocodile at their feet comes from the animal world of the Americas. At center left, Asia takes the form of a turbaned couple. A dark-skinned young man, presumably a court attendant (maybe a slave), suggests the wealth and luxury of Asian courts, particularly the Mughal courts centered in India. The painted hand of the Asian lord extends across the seam of the biombo. The splitting of figures and plants across seams suggests the painting was conceived as a unified scene, and Spanish American biombos were more often than not painted in this manner. At center right, the luxurious dress decorated with fleur-de-lis of the King and Queen identifies them as French. Correa may have been inspired by a French print of the same subject. The rearing horse, linked to European rulers, draws our eyes towards the African figures, but his head turns towards the European king and queen, creating a visual bridge between the two. The page does as well, as he turns his head over his shoulder to look at the figures representing Africa. The darkest skinned-people in the painting are Africans, dressed here as royalty, with jewels, parasol and accompanied by servants. The elephant was, in the context of the Four Continents allegory, associated with Asia and Africa. Its placement here evokes the African continent. Framing the scene are images of golden fruits, and such illusionistic frames, usually of flowers, are found on other biombos as well. Juan Correa (c. 1645-1716) was one of the leading painters in New Spain in the late 17th and early 18th century. Born in Mexico, his mother was a free black woman, and his father a mulatto doctor. Like many painters, Correa had others in his family who also painted, including his brother, nephews and grandsons. This screen is typical of biombos in New Spain. It features oil painting applied to canvas which was then gilded at the edges. The hinges between the panels allowed the screen to be folded into different shapes—extended or collapsed as the owners might desire. It measures 199 x 556 cm. Juan Correa drew his inspiration for this scene from European personifications and allegories of the world, images that first became popular in the late 16th century, in part through travel books and their illustrations. Biombos were expensive objects. It is likely that when displayed in a home, the biombo was only sometimes unfolded to its full size, as it is here. Today, the screen is in the collection of the Museo Soumaya in Mexico City. By the time Correa painted this screen, personifications of the Four Continents had long been adorned the homes of wealthy patrons in New Spain—on the ceilings of their palaces, in figurines for their mantles, and decorating book covers. Despite the fact these patrons were, by and large, of European descent, the allegory identified the continent in which they lived with an indigenous family. This screen, when installed, would have allowed viewers the illusion that they were participating in the same outdoor stroll as the figures themselves. Herrera, Arnulfo. 2014. "Alegoría de la retórica en un biombo de Juan Correal." La Colmena, 81: 51-60. Vargaslugo, Elisa, José Guadalupe Victoria and Gustavo Curiel. 1985. Juan Correa, su vida, su obra, 4 vols. Mexico City: Universidad Nacional Autónoma de México.